Horst Construction has been recognized as a Reader’s Choice finalist by Environments for Aging (EFA) as part of the publication’s 2017 Renovation Awards. The selected project is Rosemont Presbyterian Village’s Dining Room Remodel/Renovation. Help us win this award with your vote! To vote, go to the competition page, scroll to the bottom, and press “VOTE NOW”. Please note that you will be asked to vote for two additional projects, for a total of three selections. Rosemont Presbyterian Village, a senior living community in Rosemont, PA, wanted to provide an upscale dining experience for all of its residents through improved efficiency of service, worldly culinary options, flexibility in style of dining, and enhanced comfort and lighting. 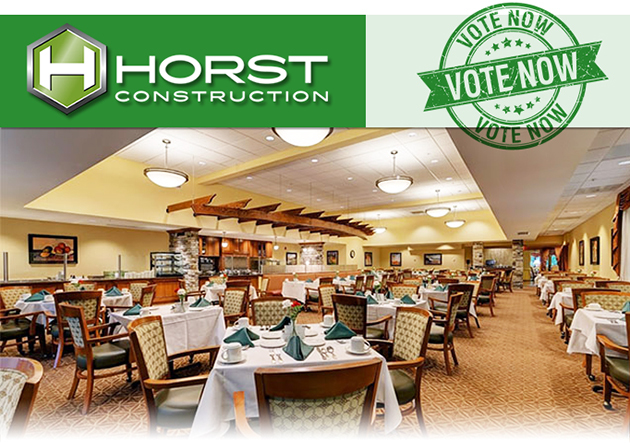 Horst Construction was instrumental in improving and updating the cooking line, HVAC system, lighting, finishes, and fixtures. Improvements to the ceiling allowed a simple solution to the issue of HVAC distribution and provided the ability to evenly light the space. Stone and stained wood were introduced to provide warm and textural highlights within the space. The space is flexible enough to serve breakfasts and lunches buffet-style and dinners restaurant style, with the additional ability to provide live cooking demonstrations during non-dining hours.